Learning how to compost in an apartment will help you recycle and protect the surrounding environment. In this way, you will be able to diminish pollution and, at the same time, you will also diminish climate change effects. Compost is a dirt-like soil which forms after food scraps, grass and leaves break down, being very rich in nutrients. Compost occurs without human involvement. The leaves falling in your backyard will compost and offer nutrients to the soil, acting as a slow-release fertilizer. However, no one can say exactly how long it will take the natural matter to turn into compost. The process depends on many factors, ranging from the size of the organic matter to the oxygen availability and temperature. The process may take from several weeks to several years when organic matter turns into compost. Numerous farmers, gardeners, and environmentalists decide to compost from various reasons. Nevertheless, you should know that human involvement may boost the process, ensuring the best conditions for nature to start the process. Specialists indicate that lawn and food waste make up 25% of all the waste that gathers up in landfills. Even if these materials are biodegradable, they do not usually break down by themselves in landfills where oxygen levels are very low. The organic matter emits methane gas known to be 20 times more toxic compared with carbon dioxide. Each tone of organic matter that can turn into compost will save 1/3 of a tone of greenhouse gases from being released into the atmosphere. Furthermore, composting will help enrich the quality of the soil in your garden. The basic method of recycling is breaking down decaying organic matter. Once this return to the soil, other living organisms will start using it. We should consider recycling in our backyards instead of sending all the garbage to landfills, polluting the air and boosting climate change. Composting is beneficial for our gardens and flowers, offering plenty of nutrients while improving water retention and drainage. Everyone can compost even if they live in an apartment. You can collect kitchen scraps and deposit it in a store-bought compost bin. Using a compost bin will help speed up the process of decomposition by controlling moisture and temperature. First, you need to consider the size of your bin. Generally, compost heaps should be about 3 x 3 feet to be more effective. You can develop a DIY garbage can that you place in a compost bin. You need to buy a big rubber or plastic trashcan that has a secure fitting lid. Then, bore 5 to 6 holes in the bottom, sides, and lid of the can to facilitate airflow. We know that oxygen is crucial in breaking down the organic materials that exist inside. You may use a small, medium or large size can, depending on the needs. Composting will help us give the soil the nutrients and minerals it needs to grow new plants. Second, you can also develop a DIY wire compost bin. This represents the structure of an open compost pile, and it also maximizes oxygen circulation. 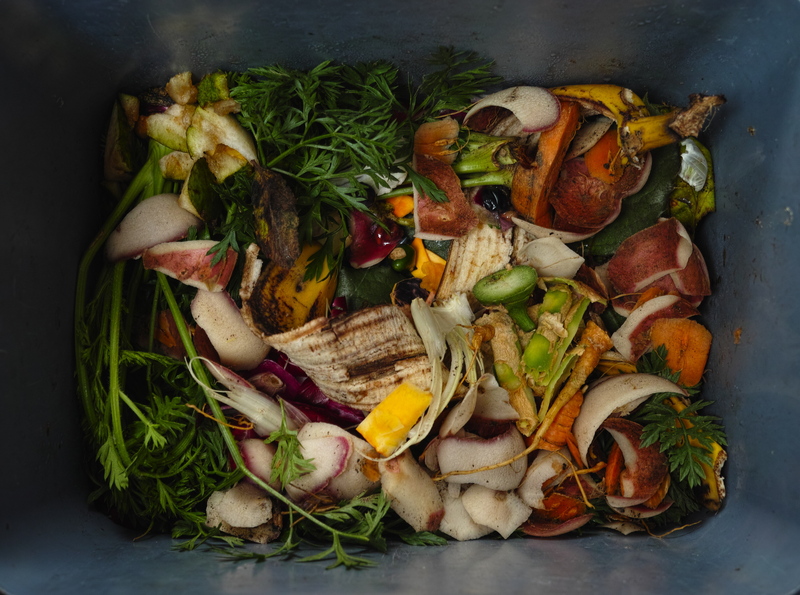 You can create your own compost bin if you produce a small amount of food scraps. For this, you will need to find an open spot. Then, put 3-4 stakes into the ground in a circular shape. Next, buy 10 feet of 36-inch plastic mesh or wide wire. You will have to stretch the mesh fence around the stakes and then tie it in place. Third, if you are not that good at building your own bin, you can always purchase a commercial one. However, you should know that it may be a lot more expensive than developing your own bin. You may also find some commercially made bins which can really fuel the decomposition process of your organic waste. In order to successfully compost, you will need a place where you can put your kitchen waste. Even if you live in an apartment, you may take all the compost to the nearest park and use it as fertilizer for trees and plants. To do so, you may need some tools. Make sure you put gloves on your list of tools. They will help you handle the debris while placing it on the soil in the park. Furthermore, you should also consider an aerator. This tool can help you with the compost heap. Therefore, when you pull the aerator back out, it will mix the heap around, facilitating the decomposition process. If you do not have an aerator, you can always use a pitchfork to poke holes deep down into the pile of debris to boost air circulation. You should also use screens to separate big chunks of compost which are decomposing from the dark soil. Hence, the debris that makes it through the screen indicates that it is ready to be used as a fertilizer in the park or a garden. Make sure you also purchase a flat-headed shovel. You can use it to transfer compost onto the screens or directly on the soil, in the park or garden. Furthermore, you can also add organic materials to the heap itself. Before starting to compost, you should learn what materials can be composted. You can compost shredded paper, dryer lint, sawdust, and woodchips, weeds that haven’t seeded, garden waste, straws, leaves, eggshells, coffee grounds, tea bags, vegetable and fruit peels, scraps and rinds, hay, lawn, and grass clippings. However, you cannot compost large pieces of compostable materials, paper with colored ink, glossy paper, lime, peanut butter, cooked food, animal bones, fats and oils, animal food products, meat, dairy products, pernicious weeds, pet waste, human waste, diseases plants and chemically treated wood. Learning how to compost in an apartment may necessitate a lot of patience until the decomposing process ends. However, the results will prove that your work was worth it and you will feel proud that you diminished the amount of greenhouse gas effects. Compost will also constitute a great fertilizer, helping plants and trees while restoring their nutrients.